Description: When the Scottish owner of Castle Keep died, the ancient castle went to his Canadian great-nephew, Robert Volnik. There was no way the Volniks could keep the castle, so it was sold to an Edinburgh lawyer, Mr. Maconochie. Two years later, Emily Volnik and her younger brohter Jessup return to the castle for a visit. To their delight, the Boggart, a mischievous shape-shifting spirit who has lived in the castle for centures, playing tricks on the owners, is still there, making Mr. Mac coubt his won sanity as strange things happen. At Jessup's urging, Mr. Mac takes them and Tommy Cameron, a local friend, on a comping trip to Loch Ness, Where a new expedition with advanced underwater equipment is planning another search for the Loch Ness Monster. 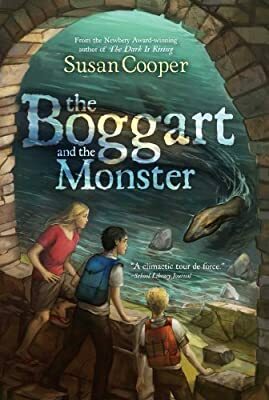 The boggart comes along, and, on thier first night there, he is entranced to rediscover Nessie, a boggart cousin who has long forgotten how to change shape and remains in the prehistoric-monster form he long ago adopted. Beautifully imagined and beautifully written, this is an unforgettable adventure, filled with humor, suspense, and wonderful characters. It is a stunning companion to Susan Cooper's earlier book, The Boggart.